Open Sorcery is a cyberpunk hypertext adventure. You play as BEL/S, a fire elemental who has been bound by C++ code to serve as a firewall. Your job is to scan the local environment and detect any other elementals or poltergeists who could be interfering with your creators or neighbors. As you identify their material and motive, you will learn more about the world around you and gain sentience — possibly posing a threat yourself. Watch the video above, or download the audio edition below or from iTunes, Stitcher, Google Play Music, Mixcloud, Spoke, Overcast, acast, Pocket Casts, Castbox, TuneIn, or RadioPublic. A complete transcript is provided after the shownotes. [Announcer] Welcome to IndieSider, where we go beyond the game and meet the developers behind today’s indie hits. 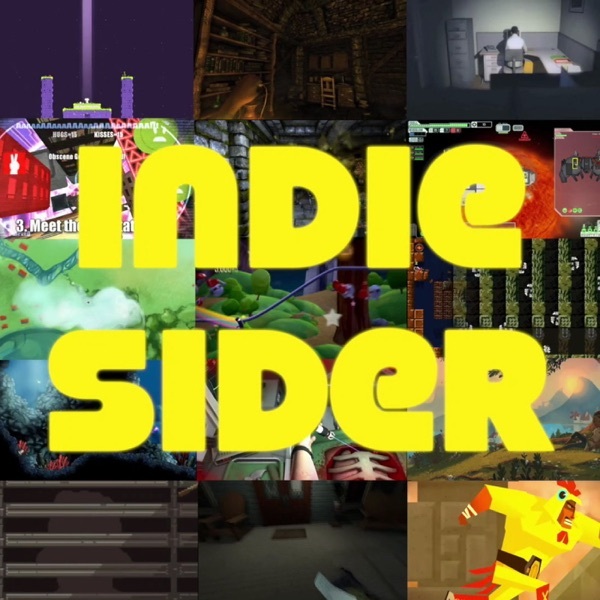 [Ken Gagne] Hello, and welcome to the IndieSider podcast, where I play indie games and then interview the developer. I’m your host, Ken Gagne, and this week on episode number 57, I’m playing Open Sorcery, by Abigail Corfman of Open Sorcery Games. This game was released on February 22nd for Steam, that’s Mac, PC and Linux, for $3.99, and previously was released for Android and iOS for $2.99. Open Sorcery is a point-and-click text adventure based on Twine, an open-source text adventure game engine. In Open Sorcery, you play as a Fire Elemental, one of those living embodiments of nature that you often find in Dungeons and Dragons-type settings, except you are a Fire Elemental who has been enslaved to serve as a computer firewall. This game is set in some sort of modern-day melange of Dungeons and Dragons, and Shadowrun, and cyberpunk. So you are a living firewall, charged with scanning certain areas of the network, and identifying other Elementals who may have invaded the area. You have to pay attention to the clues and deduce which of six Elements it is: just earth, fire, wind, water, light or dark. And then you have to deduce what their motive is. Are they here to instill order or chaos? Life or death? Once you have identified the Elemental, you are given a variety of menu-based options, such as should you speak to the Elemental, and convince it to leave the area? Should you cleanse it with fire, the substance of which you are made? Or more. As you have these interactions, what impact does it have on your own consciousness as you start to learn more about the world around you? Will you, eventually, yourself become a threat? The game has a Spartan aesthetic: it has white text on a black background, and any text that appears in red, you can click on with you mouse and choose that option, or to see what branch, either permanent or short-diversion, it takes you on. At occasional points in the game there is some background music, but mostly it is silent. There is no voice acting. However, what the game does have a lot of are words. 90,000 words, that’s 9-0, 0-0-0. That’s a lot of text, and a lot of different endings. You’re not expected to play the game all in one sitting, you can save to one of multiple slots and load and restore, so if you come to a choice and you’re not sure which one to take, just like the old choose-your-own-adventure games, you can stick your finger on that page, see where the path takes you, and then go back and try again. I really dug this game, because I felt like I got to know the inhabitants of this world. There are only four locations that you are constantly scanning, and you get to meet their inhabitants and see how they go about their day-to-day lives. And as you interact with them, you develop relationships with them, which are graded on a scale from zero to a hundred. As they get to a certain point, you can actually use those relationships in some of the decisions that you make later on, as those colleagues, partners and friends become available to you. And so, in this episode of IndieSider, I’ll be speaking to the game’s creator, Abigail Corfman, at whose website, abigailcorfman.com, you can find Open Sorcery. You can also find links to Open Sorcery and all the other resources mentioned in this episode of IndieSider, at our own website, indiesider.net/opensorcery, for this particular episode. Where you can also find YouTube footage of me playing the game; as I said, it has a lot of text. I was excited to discover this game at GaymerX East in New York City back in December of 2016, and then to see it again at PAX East 2017 this March in Boston, and now I’m finally delighted to be able to bring to you my interview with Abigail. [Ken] Joining me today is the creator of Open Sorcery Abigail Corfman of Open Sorcery Games. Hello, Abigail! [Ken] How are you today? [Abigail] I’m great, how are you? [Ken] I’m also great thank you. I am so happy to finally have my hands on your game. I first played it at Gaymer X East in New York City back in November of 2016, and then I was delighted to see you at PAX East in my hometown of Boston, just a few weeks ago. And your game is out, it came out in February for Steam and it came out a while before that for Android and Python is that correct? [Ken] How long have these games been available? [Abigail] Ah available, I think I put out the first build on mobile platforms in May of last year. And they’ve slowly been expanding and progressing up until the Steam launch as the year goes on. [Ken] Because I saw reviews of your game in the Interactive Fiction Database as far back as May of last year so that was referring to the mobile ports? [Abigail] Actually the way it started was this is my first game ever. Like I found Twine I thought hey this is lovely and I like doing this so I’ll just make a tiny game and it’ll last, it’ll take me about a month. And then a year later I had Open Sorcery and I had no idea if anyone was going to like it at all so I decided I’ll put this up online and I’ll make a mobile version because I like playing games on my mobile and I’d like other people to do that and I’ll make it a little bigger ’cause it’s going to have to cost something. So people who really like it can buy the mobile version. And a lot of people really liked it and it got accepted to some conventions and it got an award which was very nice. And I talked to some devs and looked at the culture online and decided that by having it out online for free I was devaluing the work that people do to make games. It was a big project and I didn’t think it was right and I was also hamstringing my dreams of eventually someday doing this professionally all the time, so I took it down. And I put it up on Steam. [Ken] And what is the difference between the mobile version as that came out originally and the Steam version. I understand there is a huge expansion. [Abigail] There were two levels of expansion. The original mobiles were expanded over the free online version. And the Steam version was expanded over both of those. I think there was about 10,000 words added, that includes code and text together. But, and also I added the menu and a save system which is very innovative for Twine which is, it’s built-in. And a whole bunch of other little things that made the game easier, like a speed mode, so that you could go through it quickly. It’s a game that requires a lot replays to get the full value out of it. But like any game that’s largely narrative based there are a lot of things that repeat themselves, so being able to skip through things quickly I think makes for a better replay experience. Also makes it a lot easier to debug. [Ken] And those are all things that, as you said, were not built into Twine, you added those yourself. The save system and the speed mode. [Abigail] There’s a rudimentary save system built into Twine but I had to expand it and I did it and massaged it a bit to make it work in the traditional format like, you know, press save and it saves the file and displays that. I ran into a serious problem on Steam actually wherein people, when I first released it on Steam, people were having a lot of errors with the save system. And that’s because Twine saves the entire game, like every single action you’ve ever taken, everything that’s ever been changed in the game, instead of just having a save file with straight variables. And so the save files that Twine saves balloon very quickly. They’re just text but they can get really big and my game is really really big in comparison to most Twine games. It’s seven megabytes. In comparison to most Twine games it’s very large and there are lots of different things that you can do and get baked into the save files. With five different save files I actually ended up overloading a local storage and yeah so, long story short, there were some logistical problems I’ve had to deal with for porting Twine. [Ken] You were already a professional programmer by the time you were introduced to Twine is that correct? [Ken] Some people market Twine as sort of an introductory programming language and, whereas you, you already knew a lot of other languages. What was the appeal of Twine for you when you had so many other skills in your portfolio? [Ken] And using that you’ve been able to develop this game for multiple platforms. You’ve achieved feature parity on all those platforms, they’re all the same. [Abigail] I have. I made a terrible mistake in the beginning by trying to maintain, I think, four different code bases. Not quite code bases, HTML pages basically, that I’d update with different things from the mobile versions and the Steam version. And that meant every time there was a bug I had to update four different things precisely, not making any typos. And a little after the game was released on Steam, I finally said oh my gosh this is a nightmare and I have to fix this, which was a little scary because in taking all those four code bases and smooshing them into one code base, I had to alter the code a lot. I had to put in flags instead of having different versions. But I did it as carefully as I could and honestly and it ended up pretty well. [Ken] It’s impressive that you would do that so late in the game’s development, even after it had been published, because most people at that point would just say, eh it’s done, who cares anymore. [Abigail] I, it’s my darling child. Perfect in every well. And I actually, since putting it up on Steam, I have encountered. Previously I encountered people who play games primarily on mobile, and they tended to take the game and enjoy it and just have the experience and if there were any serious problems they’d let me know about it, and I’d fix them. But when I moved to Steam I encountered a breed of gamer that would take a game and do absolutely every variation of everything, and tell me all about it in exceptional detail. I’ve been discovering a lot of new things about my game because other people have spent more time playing it than sometimes I feel that I have. I have this person who tells me things about the game that are both technical and narrative in nature. Like he found a situation in the final battle that happens only if you do these two weird things, like turn someone into a robot and also teach someone how to sing indigenous songs. It was this crazy-edge case that he thought didn’t make, it wasn’t an error but it didn’t make sense given the storyline of the game, And so I wanted to make fixes for him because he has invested so much time into it and he’s thought so much about it and I want to make the fix that he’s pointed out. That it is correct, it doesn’t make sense. So it is something of an act of love for people who are investing time in the game. [Ken] How do you test a game that has so many different flags and variables and end states? [Abigail] You do flow charts mostly. Open Sorcery has a lot of different endings. 10 main ones and just infinite iterations on those since there are lots of different meaningful things that can change. I am a huge fan of meaningful choice in games. I feel like you have to feel as if you are having a significant impact on the story and world around you, in order for it to feel like a good experience. I get that from my tabletop days. That obviously makes for lots of iteration and what you need to do there is you need to make elaborate flow charts for all the ways you can go through the game, and that will get you part of the way because then you can calculate, based on that visual. Okay what are all these strange things that could be possibly happen. But after that what you really just have to do is go through the game a lot lot lot lot lot of times. Which I have done, and that you have to get more people to go through it a lot lot lot lot lot of times, which I have wonderful friends, and some wonderful dedicated fans and they have done that for me. So the answer is flow charts and beta test. [Ken] And are those flow charts just giant pieces of paper stuck to your bedroom wall or is there a flow chart program you’re using. [Abigail] I’ve considered flow chart programs. Nothing is ever as comfortable to me as pen and paper. So they tend to be amalgams of pen and paper that, when they run off the edge of the page, eventually become notes in a text file. [Ken] And speaking of the multiple versions you’ve released, with merging the code bases and the like, I noticed at least in iOS that you’re not using a traditional versioning system where it’s like version 1.0, 1.1, 1.01. It seems to be version one, version two, version three, version four, why is that? [Abigail] Mostly because I just didn’t do a conventional versioning system. [Abigail] Yeah, I didn’t do it formally in the beginning and then just continued not to do it formally. The casualness of the just, oh I’m doing this in my free time, leaked into, leaked in after it became a professional thing. And now it would be weird to change the pattern. I’m probably going to do it more, in a more structured way for Open Sorcery Two. [Ken] Excellent and I wanna talk to you about the sequel but we’ve been talking a lot so far about the development. I wanted to ask you of course about the content of the game which I would describe as, well you tell me, would cyberpunk be an appropriate term? [Abigail] Cyberpunk I think would work very well. Shadowrunesque is one I like. But yeah I like cyberpunk for general consumption. [Ken] I was actually going to ask you about Shadowrun specifically because that is something that it reminds me the most of. Would you say that was one of your inspirations? [Abigail] Absolutely I have always loved the feel of Shadowrun. The only distinction I find with Open Sorcery that kind of moves it slightly away from the cyberpunk genre and Shadowrun also, is they tend to be kind of dark, gritty and edgy. And Open Sorcery is kind of a blossoming fire of hoke and potential to scare and delight, and whimsy, and danger. So it has a lot of like positive care bear things. And the darkness is less the point if that makes sense. [Ken] And yet I noticed that in the Android store the game is rated as being for teens and up due to violence, blood and language. And in iOS it has mild realistic violence, suggestive themes, and fear themes. So these still sound rather dark. [Abigail] That’s true. There’s, I think, a distinction between having a game with dark elements in it, and having a game whose purpose is to be edgy. And I find that games I play in the cyberpunk genre and fiction I write, often the point of it is to be edgy, which tends to limit it I find, in exploring softer themes. And I would never want to do that. [Abigail] I think that there is a lack of gentleness in the voices of video games nowadays. And I think that there’s a perception that in order to be taken seriously you have to be dark. In order to be taken seriously as a genre or a game or a piece of writing, you have to have a mature content, but not just like in sections of the game, it has to color the entire thing. And I feel like you can have delightful soft cute sweet things and also an element of darkness in your games, and that neither invalidates the other. [Ken] Your game has those dark elements but it’s not about the darkness. It’s definitely about emotions that is a lot of what the elementals and the motives are about. And when I played the game at Gaymer X East, I only played it for a short time. I think one of the things I did early on in the game was I cleansed an elemental with fire. I think I killed it. As I left your table I said, I feel really bad about what I just did. And I think you said, that’s just the reaction I want you to have. [Ken] So what reactions are you looking for from people? [Abigail] I’m looking for people to look at the characters in the game and feel these are real people and I’m taking seriously the interactions I’m having with them and I’m taking seriously the consequences of the things that I’m doing to them. I want to evoke a love and connection with the characters in the game so that people have a genuine experience and can touch on also feelings of fear and loss when they are in peril. I want to, I really wanted to create something real and intense with the game. [Ken] So this is not a game to be played frivolously and just quickly choose whatever option amuses you? [Abigail] Well I mean I wouldn’t object to someone playing it like that. It certainly has its jokes and its entertainment value. And I’m totally okay like. That’s the thing about emotional investment and trying to evoke reactions like that. Someone, it’s a two sided thing. It takes two to tango, it takes consent to have an emotional experience. So if someone plays the game and doesn’t wanna like, dig deeply into their soul and feel remorse for killing the poltergeist, that’s all right. I would not feel that they were obliged to. But if you do want to engage I want to make the world as real and vivid as possible. So that you can, there’s meat there for you to work with. [Ken] And is this what you mean when you say that a lot of games nowadays lack gentleness. Is it more about connection and emotional narrative that games are lacking? [Abigail] I think you’ve got it. I think that is a much better way of expressing that yes. I think one of the reasons that that tends to get stunted or not quite reached is because people. You know what, I don’t know, I don’t know why. I just want more of it. I just want to see more of it and make more of it. [Ken] No I can totally appreciate that. I love that one of the four venues that I’ve been scanning for threats is a retirement home, because I have aging parents and these characters become relatable to me. And as you said in your interview with Black Nerd Girls, it is a demographic not often seen in gaming. [Abigail] Yeah, old people right, they’re awesome. [Ken] They are, what are they called, golden gamers? [Ken] Mm hmm yeah and there are other demographics in the game that we don’t often see such as Decker and his partner Andy. [Ken] You know that scene, which I won’t describe in detail to avoid spoilers here, showed a side of Decker that I was not expecting because he seemed somewhat detached. His insistence on referring to Bells as an it, instead of a he or a she. I just felt like that was somebody who is somewhat emotionally reserved. And then we got to see a side of him that is very emotional and may even have explained to us why he is the way he is. [Ken] Is it due to these different demographics that you were at Gaymer X East, because when I first played the game, as I said, unfortunately I had only a few minutes to try it. And it was not immediately apparent to me what made it a fit for that convention. [Abigail] Yes exactly that. I actually started designing the game, started choosing the places, with an eye towards what kind of people don’t tend to get featured in video games. And that’s why I included the retirement home. And that’s why I included Decker and Andy. And, spoiler warning, Mrs Best and Miss Finn. The reason that I didn’t make it explicit that Decker is a gay man is that I didn’t want it to be like a big point. I didn’t want it to be like ah I am doing the inclusivity thing because I think that can often be more damaging than it is helpful because it makes like, it exotifies alternative sexualities. And I think that the best thing to do is, at this point in time probably, is to have them just exist, and it not be a big deal. And it just, have their occasional moments in the game where people go, oh, that’s an aspect of them. Okay let’s move on with the game. [Ken] Yeah it was, in a way it was very subtle. I mean it was hard to miss but it was also so delicately and gently handled that it took me a second to realize what was happening because you weren’t making a big deal out of it. [Abigail] Good I’m glad that’s how it came across that’s how I wanted it. [Ken] Yay, success. Not only were you at G X East, you also went to your first PAX East, your second PAX having previously been to PAX West. That’s a very different environment from Gamer X, not only in focus but also in size and scale. What was your experience at PAX East in Boston? [Abigail] It was really lovely. I was lucky to have gone through the fire of PAX West and been forged into a iron-clad convention warrior before going there so it was a lot easier. It was just lovely. It, I was delightfully positioned in the Indie Megabooth between Girls Make Games and the Interactive Fiction Meeting Room. So it was just like Girls Make Games, a summer camp, a place where, I’m not sure if it’s a summer camp but it’s a program that encourages girls and mentors girls through developing video games. So you’ve got that and then Open Sorcery and the Interactive Fiction Reading Room which is all sorts of fascinating visual novels which, lots of female or female identifying or gender queer authors and so it’s like Girls Make Games, proof, proof. Which was delightful to me. [Ken] Was it difficult to entice people at PAX East to sit down and play a text game? [Abigail] I expected it to be much more difficult than it was and the trick I think was, one, to, I was lucky enough at both events to have a big screen television that I could put the game up on. And I had a screensaver which is my trailer for the game that most of the screensaver is code, red and white code blinking onto the screen. That would, even across a hall, attract programmers towards the game. So I got a steady stream of tech geeks who would come over and be like, is that code. And because the moving and the bashline and the scripts immediately just drew their attention. In addition I got a lot of people who saw the name of the game which was displayed prominently and came over just because of the name of the game. So the text code and the name of the game steadily pulled people and I actually think I benefited from the fact that it was so predominately displayed as a text only game, because the people that wouldn’t be interested in that kind of thing, immediately saw it for what it was and went somewhere else. And that’s good because they wouldn’t have been interested in it anyway so they successfully filtered themselves out and the people who were super-interested came in and wanted to learn more. [Ken] I’m glad you mentioned the name of the game because that is actually on my agenda to talk to you about. It is a brilliant title, I love it. [Abigail] I love it too and it is, I have a brilliant, brilliant boyfriend who is amazing at naming things, who came up with the idea as a joke. And I was like oh that’s funny! Oh but it couldn’t possibly be serious. And then the next day, oh that’s funny. That can’t, yeah that’s, I’m gonna make a game. So yeah and there’s a reason that I grabbed it and smooshed it into my business name. And it’s going to be on all the sequels that I have Open Sorcery something, because it’s perfect, it is a pun, it’s funny and it perfectly expresses the world. [Ken] But I have to ask, is Open Sorcery open source? [Abigail] It originally was. When it was online you could look at the source of the page and get all the Twine script. It currently is not since it’s on Steam and the phone games. Further on in my career when I have made more games and there’s more stuff out there, I plan to eventually make it open source again, because that seems right in a profound way. [Ken] It seems fitting given the title. [Ken] Speaking of the game’s development again, in one of the versions of the game you had a feature called a dream log which got removed. For those who haven’t played the game yet and haven’t made it to the dream sequences, could you tell us a bit about what that once feature was. [Abigail] The dream log basically as an artificial intelligence, occasionally you went dormant. And the first time you went dormant you were like, you know what, this is kind of like sleeping, maybe I should try this dreaming thing I’ve heard so much about on Google. And you can choose whether or not to dream and every time you dream, the way you dream, if you get up on the brilliant idea initially, of you get one of those like dream meaning websites with all the like, like bears mean you should quit your job and snakes mean you’re going to find a lot of money, and it took basically all of the symbols for meanings and dreams, and the artificial intelligence bells, randomly generates lists of words or stories with the words, basically ad-lib’s dreams together. And what the dream log did was it saved every single one of those ad-libbed dreams. So you could go back and look at them. The reason I had to take it out was that saving issue I mentioned before. I’m eventually probably going to fix this but there’s only so much space in local storage. So the save files have to be small to, have to be smaller than a certain amount, and the dream log took up a lot of space. So I cut that out to make the save feature safe. [Ken] Ah that seems like a reasonable compromise but I am glad to hear that it isn’t entirely dead it’s just hibernating. [Abigail] Yes, yes a little. That is an appropriate description of it. [Ken] So you’ve released this game on Steam, Android, iOS. I looked up the reviews of the game. Almost completely positive on every platform but one discrepancy I noticed, if, correct me if my numbers are wrong. It looks like the game has about 35 to 40 reviews on Steam, about 87 on Android. I didn’t see any on iOS, is that correct? [Abigail] Oh no I think I have reviews on iOS. I see them in my iOS developer’s store at least. There definitely aren’t as many. [Ken] Okay maybe I was looking at the wrong link but is it accurate to say that based on the numbers I saw, Android is significantly more popular than the other platforms, or is that just due to it having been out longer. [Abigail] I suspect, I think that Android is definitely more popular than iOS, and I think that’s due to the fact that when I first released it I had it done on Android first. So I let everyone on my Facebook know that it was out on Android and people weren’t aware that it was out on iOS. So that was Abigail releasing her first game and not knowing how to do marketing. I suspect that the Steam numbers will go up over time because it is a fairly recent release. [Ken] You mentioned that you like to play games on your mobile device and that’s why you made this game for mobile first. But when I think of text adventures, maybe because it’s, I’m old school and I grew up with Infocom and Zork, I always think of wanting to sit at a keyboard to play text adventures. Your game doesn’t require the keyboard but still it seems like a more natural fit for a laptop or desktop to me. Is that just me? [Abigail] Let’s talk about parsers. This is one of my favorite topics of conversation. [Abigail] Yes. I am also an ancient Infocom geek. I cut my teeth, my very first video game that I played all by myself was Zork Zero on this brick of a laptop. And I loved it and it’s where I get my little fetishism from and I just, I loved Infocom, I love the text based games, I love the parser games. Emily Short is amazing. And I love them but as you do when you’re honest about things you love, you admit their flaws. And the difficulty I’ve always had with parser based games is that when you’re playing the parser based game you’re playing two games. You’re playing the game and you’re playing guess the specific word that the dev was thinking of when he designed this puzzle. Very often that game gets in the way of the actual game and is greatly to the detriment. And that is a problem that parsers have always had and as technology has improved and now parsers have become more robust it’s gotten better but it’s never entirely disappeared. The thing I adore about Twine and I why it got me so excited and why I wanted to make a game on it is that it doesn’t have that issue and the text, the illuminated hyperlink text that you click on or tap on if you’re using mobile, to lead you through the game it gives you a constant activity. It gives you a constant thread to lead you forward. So it’s not impossible but it’s much less likely that you’ll get stuck in a portion of the game. That’s one of the big goals I had for Open Sorcery. There was never a point in the game where you’ll get stuck. That’s not entirely true you could get stuck during one of the scanning ones, but if you do, you’re usually able to look like just, okay I’m pretty sure it’s here I’ll guess at all the others. But that’s getting off topic. The point is that while interactive fiction is conventionally parser based and we have a long legacy of that and it’s beautiful, I think Twine is definitely the next step forward in terms of usability for interactive fiction and text based games. And the most awesome thing about it is because you are just clicking or tapping the words, it’s perfect for a mobile environment because you just tap them and that’s what you always do with things on your phone. I’m done. [Ken] You say this is the next evolution but at the same time it also constrains the player’s agency. They don’t have this expansive vocabulary any more they have to choose just the words that you’ve highlighted. Does that fit the definition of an evolution? [Abigail] I would counter with pointing out that the illusion of expansiveness in a parser is just that, an illusion. You only have the options that have been programmed into the parser and while those might be elaborate they’re inevitably limited by the amount of the time the dev has. Your options are just more exposed in Twine game. [Ken] I can see that. [Abigail] You are correct though that it’s easier to pack more options into a parser game because you don’t have to display them all. So there’s probably going to be a place for parser games in my, you know, new world order utopia. [Ken] One thing that moving from a parser to this hyperlinked based interaction does is it’s very interesting that video games are the only entertainment medium I can think of that actively does not want to be consumed. Like if you want to watch a movie you just sit down for two hours no matter how challenging a subject the movie is, you’ll get to the end of it as long as you just sit still and have the patience. Same thing with a book. But with a video game you can get stuck. The game is actively fighting you. To make it harder to see the rest of the game. With Open Sorcery and games like that, and other types of Twine games, that’s not always the case. I mean if somebody is dedicated they can get to the end of Open Sorcery. [Ken] Does that imply a lack of challenge? [Abigail] That’s such an interesting way of describing it I’ve never thought about it like that before. But yes so many video games do literally fight you like send waves and armies of people to fight you to keep you away from the end of the game. That’s cool. [Ken] Will it can be cool or it can be frustrating because you pay 20 bucks for a movie you’re gonna get all of the movie. You pay 60 bucks for a game you might see only a quarter of it. [Abigail] Well that’s true but I think one of the things that actually paradoxically of value in the game is that frustration, is that obstacle, because so much of the satisfaction you derive from a game is overcoming challenges and it’s, overcoming challenges isn’t satisfying unless they’re like significant challenges. My boyfriend Josh, a couple of months ago, beat XCOM on Iron Man Classic and bejesus, if that wasn’t more than a 60 dollar price tag. So it’s funny, it’s funky. The joy of video games is definitely more of a back and forth, more of an interactive experience than other, some of the more passive mediums of entertainment. I’m not sure, I’m not sure about the answer to that question. Open Sorcery definitely does have a clear through line. Most of the challenge of it is getting all the achievements and going through the game again and again. Most people that I talk to actually kind of lose the game the first time through because they get to the end and I won’t, don’t wanna spoil anything, but the end can be pretty hard. Generally I find that people quote unquote win the game, or get and ending that satisfies them on the second or third run through. While you can move through the game and are guided through the game via the ongoing text, the challenge comes from getting the resolution to the game that satisfies you. [Ken] So getting an ending is not challenging but getting the ending that’s right for you can be. [Ken] I wanna take a quick tangent here. You mentioned on one of your websites that Open Sorcery is the first major creative product you’ve completed since A Moment of Peace. Can you tell us about A Moment of Peace? [Abigail] A Moment of Peace is my webcomic. I did it when I was living in Ohio and Ohio is a lovely state but a state that was very far away from my friends and family. So I started that webcomic at a very sad and lonely point in my life and it’s about hope and love and monsters and gods. Serene slugs and lots of. It was just me trying to express a wistful feeling of what is good in the world, even while I’m sad. And I am very fond of it. I am just. I look at a lot of the comics I made and I just feel yes that is, that is what I would want to express that is, that is good. I find that it just, it’s hard to talk about ’cause it was a very personal project. Do you have any more specific questions? [Ken] You made this webcomic at a very different time in your life, you’ve since moved to New York City, created Open Sorcery. What would you say are some of the themes that run through all your work, if there are any? [Abigail] Choice I think. The importance and existence of choice, both in terms of moral decisions and self-determination and free will. Like in Open Sorcery choice is like super super important to me and to the main character because you decide what she becomes in a moment of peace. I guess that’s kind of a cop-out answer because, in any story, the thing that makes a story interesting, is the choices of the characters. Let me try and come up with a better answer. [Ken] I don’t know that there are better or worse answers. It’s all about what’s important to you and just because it’s important to other people too doesn’t make the answer less valid. [Abigail] Thank you. Whimsy and sadness. [Abigail] Ah yes that’s definitely. You definitely picked up on my fondness for that word. Whimsy, gentleness and a certain darkness. A certain exploration of the sharp side of feelings. And the expression of that fact that whimsical gentleness doesn’t preclude the darkness from existing. [Ken] The darkness almost sounds like a metaphor for melancholy or grieving. [Abigail] It can be. It was very much in A Moment of Peace. The kind of, the longest story in A Moment of Peace is called Crux’s Climb which is a story about three gods that formed a conga line of infatuation. And I wrote that after experiencing my first heartbreak so melancholy is a very good description for the form that the darkness took there. [Ken] Well I’m glad you had these outlets and these are not easy experiences as many people listening to this may be able to relate to. It’s not everybody who turns it into a creative project and has something to show for it. I’m glad that you did that. [Abigail] I’m glad that I did too. I sometimes get fan mail for the things that I’ve made and the ones that I love seeing the most are when people write me and tell me that reading something I’ve made helped them understand something within themselves or get through something. I made a story about a balloon that was set free by its child, and explored the world and soared high, so high up into the sky that it was pierced by the edge of a star and fell back to the ground. And it’s last words were, I was free, I believe. And after I wrote that someone emailed me and said that she was moving to a new city and she got that story as, just after she’d moved and that she felt as if I’d been speaking directly to her and it really helped her come to terms with the move that she was making and that was just the best thing in the world. [Ken] I think this is the kind of emotional connection that you were saying is lacking from some of the games. I don’t know how many people could have that connection with Call of Duty. [Abigail] Yes. And I have a theory actually to why that connection sometimes seems lacking. I think that that connection requires vulnerability. You need to be willing to put something real, something, a piece of yourself that is raw and real and exposed and that you might be afraid other people would make fun of. And that’s a really scary thing to do. Even if you’re not in the same room as the people playing the game. There’s a very, not quite sure how to put it. There’s a very, there’s a somewhat macho culture around games, that I think makes it very hard to be able to be vulnerable like that. And that’s sad. [Ken] Yeah I would definitely say that much of gaming culture perpetuates that toxic masculinity where men are not allowed to be vulnerable or fragile and that is a missed opportunity. [Abigail] It is and it’s so sad and it must be so painful. And I wish they could. [Ken] But I love that you are making art that helps reverse that trend and I hope that we’ll see some of those themes in your next game that you’re working on which is Open Sorcery Two. Can you tell us a bit about that? [Abigail] Yes it is Open Sorcery Two C++. It’s water themed. I have made the intro and the intro is not sufficiently beautiful so I’m going to be remake the intro, probably multiple times before the game is over, because the introduction is the most important part of the game because you have to pull people in. And the, in the beginning of the game you are well, the game starts with you lying at the bottom of a dark ocean among your broken dreams. And where Open Sorcery was a game about building yourself and creating yourself, Open Sorcery Two is going to be a game about reclaiming yourself. [Ken] Do you still play a elemental? Are you still scanning for threats? [Abigail] You are actually going to play an open sorcerer and instead of scanning for threats you’re going to be building programs or spells, depending on how you like to classify magic. [Ken] One thing that I have noticed in common with the next game, although I’ve not played it yet is the love for puns in the title. It was not until I actually said the name of the game out loud that I groaned. [Ken] ‘Cause when I first looked at it I’m like oh it’s, she’s taking water to the next level. It’s, oh it’s C++, I get it. [Ken] Well done. As well you should. When can we expect to get our hands on that game? [Abigail] Well I’ve only just started it and Open Sorcery, I’m thinking it’ll probably take me about a year, but I thought Open Sorcery was going to take me a month, and it ended up taking me a year. So I’m not sure, but I’m hoping a year. [Ken] And while you’re developing that game you’ll continue to support the original Open Sorcery? [Abigail] Oh yes absolutely I am doing that excitedly and diligently. [Ken] And what more remains to be done? It seems like it’s in a pretty stable state at this point. [Abigail] Ah not much honestly. I’ve had lot of requests on Steam to include achievements so I might do that eventually. There are a few tiny things I want to tweak. I’m not getting as many error requests as I did when it first came out on Steam which was startling. A lot more people were playing the game at one time, probably more than at any point. You mentioned previously having looked at the review numbers on Android and Steam. It’s funny because I got less feedback about the game when it was on Android and I’m not sure if that’s because it’s a different kind of player or maybe it’s just that it was on Android for longer and so it’s just been more gradual. Whereas it’s only been on Steam for like a month. [Ken] Interesting I have no theories as to why that might be. I have not owned an Android device myself so I’m not familiar with the kind of person it attracts. [Abigail] I don’t know either, I haven’t like seen numbers for this but it’s my understanding that phone games attract a more casual. [Ken] I have heard that as well and I could see how that might be a contributing factor. So for those who want to follow along with your work or get their hands on Open Sorcery and be informed when the sequel comes out, where would they go online to get that information? [Abigail] There are three things that you can do. And you can access all of these at my website, it’s abigailcorfman.com. Or probably the easiest way to get to it is to Google Open Sorcery and you will find it as one of the first results. You can sign up for my no-spam email. My vegetarian email list. We produce no-spam, we only put out alerts when I actually make new games. [Abigail] Yes I hate mailing lists and so I wanted to make mine as as possible. That is one option. You can follow me on Facebook. I do lots of updates on Facebook. It’s where most of my friends are and my main social media choice. So I tend to be more casual and talkative there. You can follow me on Twitter, either @AbigailMoment or @OpenSorceryGame. AbigailMoment is more like casual talking if you want updates about my life, my opinion of cars. I bike a lot and I have opinions about cars. And other things, you can follow AbigailMoment. If you would like just the Open Sorcery, OpenSorceryGame is where you should be at. And I think that’s it. Oh I also have a dev blog but you can follow Twitter for that, or follow the dev blog you can find the link for that too. [Ken] And there’ll be links to all those in the show notes which can be found at indiesider.net/opensorcery. Abigail this has been an episode of IndieSider unlike any other and I’ve enjoyed it immensely. Thank you so much for your time.